The blades are self-sharpening which are made with Chromium steel. The rounded tip blades and comb will prevent your skin from irritation and scratching which ensures a long-lasting performance. 60 min cordless use by 1-hour charge, there is also a quick charge option. The full-size metal guard trimmer is with an 18 adjustable lengths setting comb (1mm-18mm). Actually, this is the main trimming head of this device. The precision trimmer can create fine line; follow every contour of your body. By the nose trimming head, you can remove your unwanted hair of nose and ear without pain. 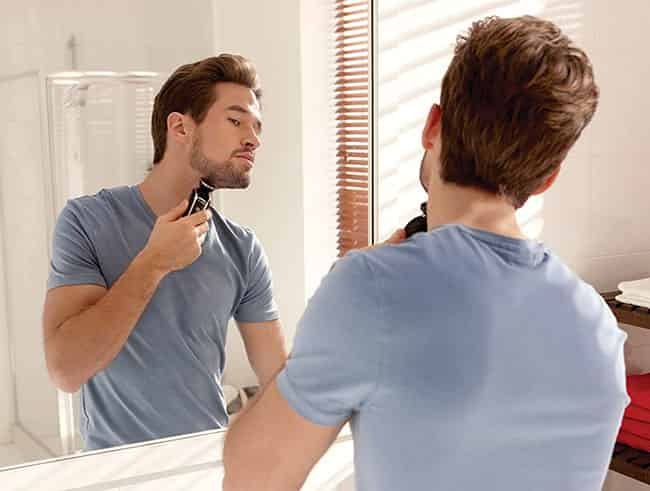 The body-groom shaver can shave below the neck very comfortably and gently. 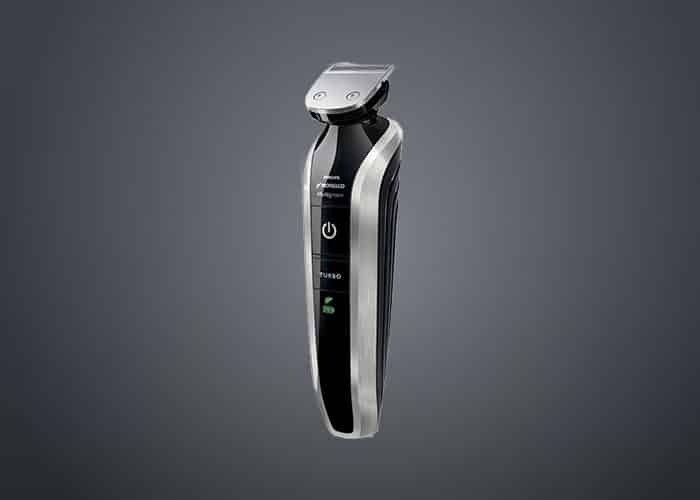 For a fully smooth finishing, trim and shave in one stroke. The hypo-allergenic foil is used on the shaver head. The hair comb will help you to create different haircut style. The hair comb comes with 18 length settings from (3mm-20mm). The body comes with 10 length settings, help to trim your body hair at your preferable length. The shaver is for cordless use, so you can use it under the shower. If you want, you can use it dry. The shaver is 100% washable. The turbo boost power will help you to cut longest and thickest parts of your hair by raising the cutting speed. The blades are skin friendly and self-sharpening which will give you long-lasting performance. The rounded blade tips and comb protect your skin from scratching and irritations. 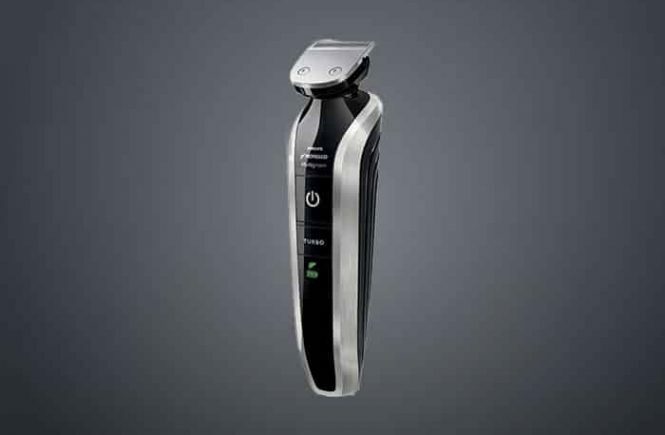 The Lithium-ion battery will provide you 60 min shaving time by 1-hour charge. Since the shaver is waterproof, so it is very easy to clean. After every use holds the shaver under running warm water. Can you use it with plugged in? Sure. But when you will use it under the shower, that time you can’t. What foil does this series use? How long the shaver should charge for the 1st time? Can you use it private/groin areas? Do the blades need to be oiled? Oil the blades every 3 months. Which country made this Groomer? How much wide the guard? The Phillips Norelco 7100 comes with 1 Lithium polymer battery. The battery will give you enough juice per hour charge. The battery will provide you 60min run time per 1-hour charge. There is also a quick charge option. The LED display will give you a notification when the battery is low/empty/full charge. I was pleasantly surprised by the Phillips Norelco 7100 multigroom when I opened the box for the 1st time. There are a lot of fancy attachments in it. Changing head is super easy. Just twist the head, it will be removed. My shaving experience was also satisfactory. The built quality is also good. The motor of it is a little quieter than my old trimmer. This motor has no lack of power when it cuts hair. When you will cut your hair by this tool you can hear the variety in the motor between heads. As an example- the motor will move faster and louder when the precision detailer on the gourd with the main comb. 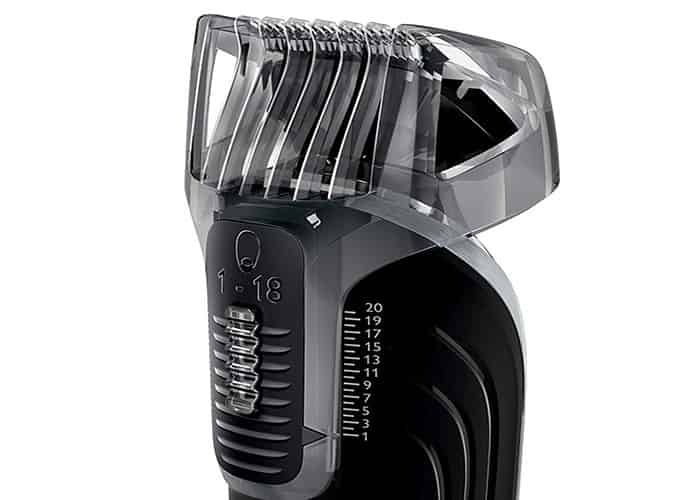 The main trimmer is very functional because it is combined with the beard trimmer guide comb, there are 10 length settings in it and you can give your hair desired length as you wish. But the desire length setting is difficult. You have to give enough pressure to move the trimmer setting one from another. It will be wiggling back and forth to get set where you want. One other negative side, there is some wiggle in the guide comb, when I pressure it, my figure holds the guard on its place. This could administrate some subordinate unevenness, I am conscious to keep my finger ON/OFF the trimmer comb whole time. This wobbliness is a matter of fear but in practice, I have never felt any problem come out from it. This is like the main trimmer, only it is thinner than the main trimmer and it will provide you with more control. I use this on my beard and back side of the neck to shape the lines without a guard. There is nothing special feature in it, only cut less of your beard at a time and give you little more control over the shape. There is a good thing in it, it is much thinner and trim the wiry little hairs without hitting, as an example- under my lips. I was pleasantly surprised by this part. This part is more than any other. When the first time I used this attachment I was worried, how will be the output? I could complete it perfectly and I was glad. It is a double foil shaver, so you don’t need to worry about which direction you need to move it or how you have to hold it. You can administrate it any direction and it can shave any area of your body. It can take a few passes in different areas from different angle; normally just administrate it back and forth. It can follow every contour of my body even sensitive areas. I never felt discomfort to shave by this attachment. It does not work well in my stubble. I have tried it a few times, it kept me a constant fear. Unfortunately, if you administrate it in your beard from the wrong angle the shaver becomes clean off. I have used it not more than a couple of time. This comb behaved like the beard comb- the same wobbliness. It made me nervous but finally, I did it perfectly. I applied it to my arms. It looks like the beard trimmer comb and works well. I did not feel any hitting by it. It was giving me satisfactory performance and I am sure it does not hurt in the operation. This multi groom met my expectation and the Double foil shaver was a pleasant surprise for me. Based on shaving performance I will give 4 stars out of 5. I am really shocked; there is no cleaning brush with it. There is no cleaning base with it so we have to clean it manually. The manufacturer highly recommended that after every wet use the user have to clean it. The Phillips Norelco 7100 is 100% waterproof. For that cleaning is so easy. For a thorough hygienic clean, 1st apart all the parts from the guide then hold the parts under running warm water. Then use a few drops of liquid soap. Since there is no cleaning brush with it and without a cleaning brush it will be difficult to come out the hair from the guide body. So you can buy a cleaning brush separately from any shop. After a rinse, let the parts towel dry then air dry. When you will use a towel for dry you have to be so much care. At last, adjoin all the parts. Use the lubricating oil, as the manufacturer recommends on the user’s manual. After 6-12 months of use, you have to replace the shaving foil head recommended by the manufacturer. The replacement parts are available in Phillips’s website. Otherwise, you can visit many online shops. After replacement, your tool will work like before. But the replacement is costly also. Yet, I think replacement is better than buy a new tool. Some customers are happy and some are disturbed. Those customers who are disturbed they have many objections like below about the Phillips Norelco series 7100. I am really excited to know what happened with 4 and 5 stars customers and what happened with 3, 2, and exceptionally 1-star customers. But all these customers used the same product. I already told about series 7100 in details. Now I will tell you about the series 3100 and 5100 in the shortcut. It will help you to take your decision that which will be best for you. 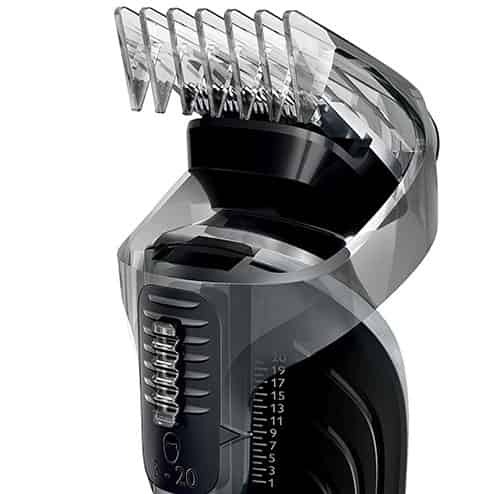 The Philips Norelco 3100 shaver comes with 5 attachments (3 heads+2combs). 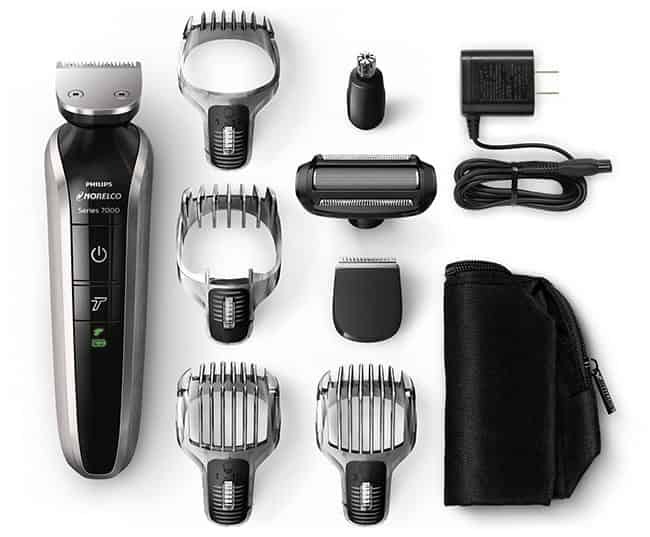 The 5 attachments are (1 full-size trimmer, 1 detail trimmer, 1nose trimmer, 1 beard and stubble comb, hair comb). The shaver is for cordless use. It is very easy to clean because this shaver is 100% waterproof. But the battery is very poor quality. Because the battery will provide you with only 35 min works time with per 10 hours charge! This shaver also 100% waterproof. The battery will provide you 60min per 1-hour charge. 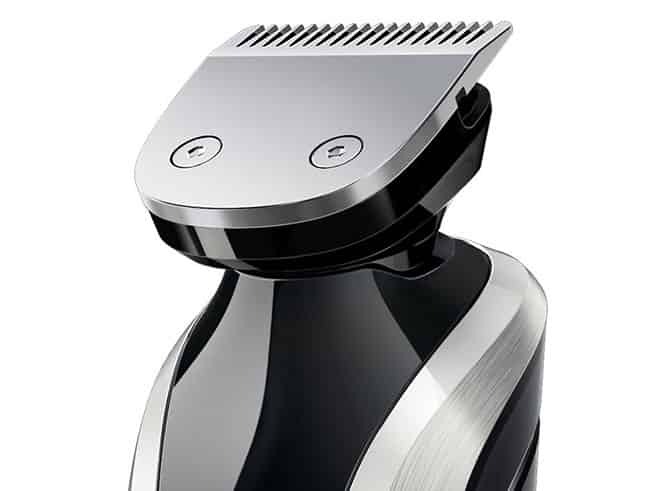 The special feature of this shaver is – turbo power. The turbo power will help you when you shave thick hairs. This feature also has in series 7100. The series 5100 has 7 attachments and the series 7100 has 8 attachments, this is the only difference between them. Otherwise, there is no notable difference in the features between 5100 and 7100. The Wahl 9818 Multi-groomer is one of the favorite Brands. It is made in the USA. The battery will provide you 180 min operating time per 4-hour charge! 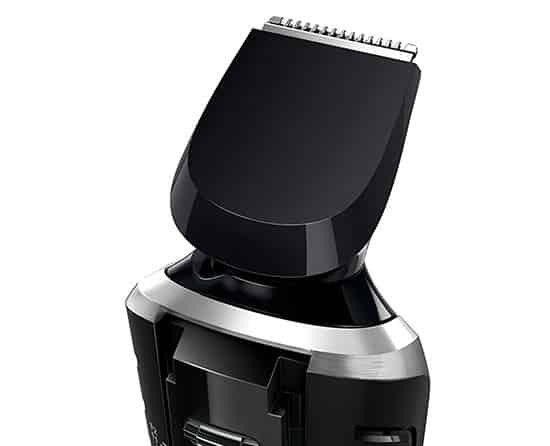 If you compare this shaver with Phillips Norelco series 7100, the Wahl 9818 is cheaper than Phillips but it comes with more feature than the Phillips 7100. The battery life is so long 180 min is enough for groom all body. So you can keep it on your consideration. I am really surprised to see the Phillips Norelco Series 7000 MG7750/49 grooming kit. It comes with 23 pieces of instruments. But this groomer is also cheaper than the Phillips Norelco 7100. In this package, you will get 23 pieces for all your trimming needs. The battery is made with Lithium Ion. The blades are self-sharpening and this sharpness will be retained up to 5 years. These 2 products are cheaper than the Phillips Norelco series 7100. But the function, durability is more than it. Especially, I am impressed with the Phillips Norelco series 7000, MG7750. It comes with a lot of function and how long the battery life is! The rating of customers is also more than the other 2.